Uh, I mean, don’t go anywhere until you’ve read this post ‘cos the clock is ticking and to be quite honest, I’m not sure how long you’ve got left to take advantage of this extraordinary offer from Beautique.com. 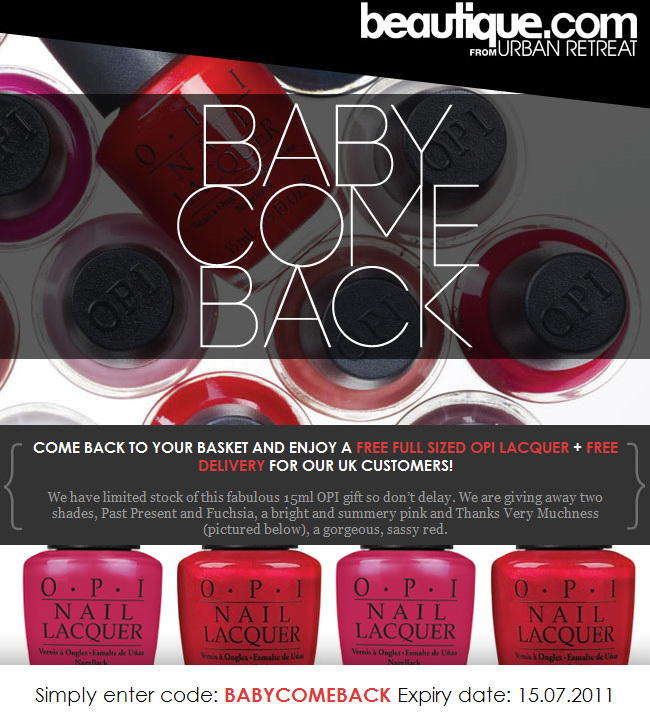 Well, how about a free O.P.I nail polish AND free UK delivery? At the same time, all at once with no minimum spend? If the deal takes your fancy you have until an unspecified time TODAY to claim the offer. I know, I know… it’s my bad, I found the email in my god-damn junk folder last night didn’t I? RUN, RUN LIKE THE WIND AND BUY SOMETHING. Um. Only if you want to of course… don’t be waving your credit card bill at me like that! I got it too! There were a few things that I’d been eyeing up on the site recently and this post (and the OPI of course!) tipped me over the edge. You are bad for us LADY! !